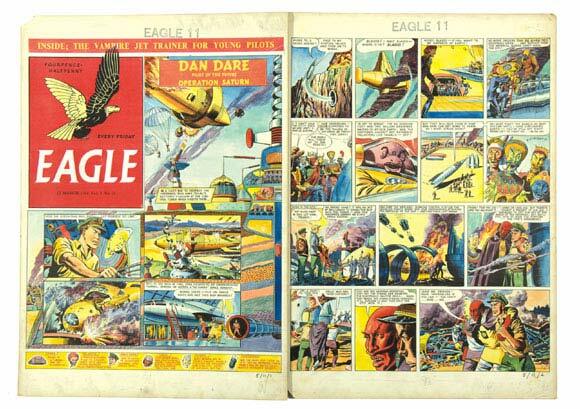 Eagle and Dan Dare were firm favourites with our bidders and some quite interplanetary prices were realised as we offered a rare collection of comics, artwork, toys and merchandise starring the legendary colonel. Two brilliant action artworks from 1954 by Desmond Walduck were lotted together from the Operation Saturn story where Dan’s battered spaceship attacked the Kroopak spaceport. Happy landings with £1540. 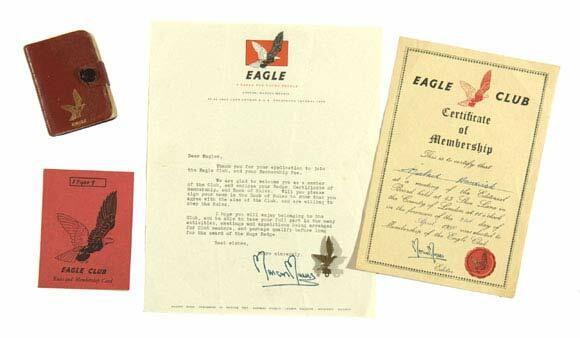 An Eagle Club letter signed by Marcus Morris with Membership Card, Eagle Badge and Pocket Dictionary brought a massive £555 and a rare run of themed Postcards and Birthday Cards celebrated £308. Dan’s Picture Card Album was originally offered with Calvert’s Tooth Powder and this example had all the 26 cards unmounted and as new, just the way collectors like them. £160 brought a toothy grin from the vendor and a wry smile from the winning bidder. 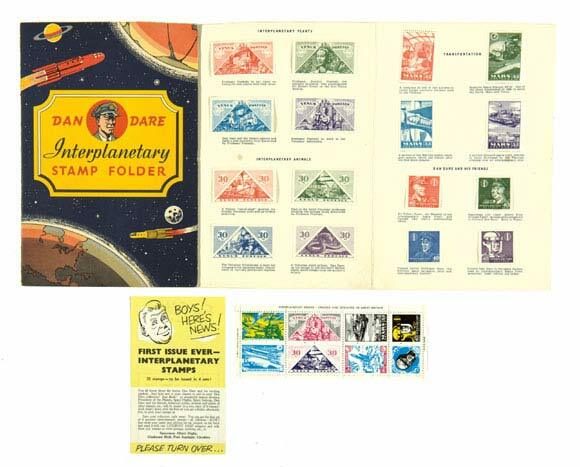 Dan Dare’s Interplanetary Stamp Folder with stamps were only available if you sent off for them with a Lifebuoy soap promotion. This set had the original flyer exhorting you to do this by legendary spaceman, Albert Digby. Well washed at £140. 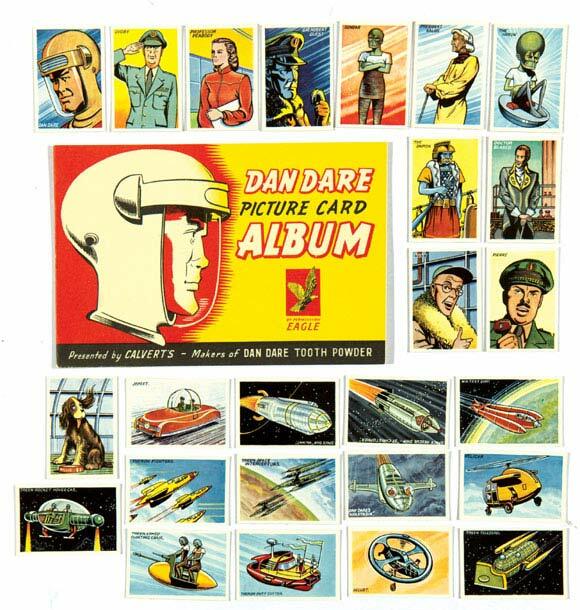 Also featured were 2 Dan Dare jigsaw puzzles, a pocket watch (not working), brand new Eagle Cricket Ball, and three diaries. Making notes at £329. 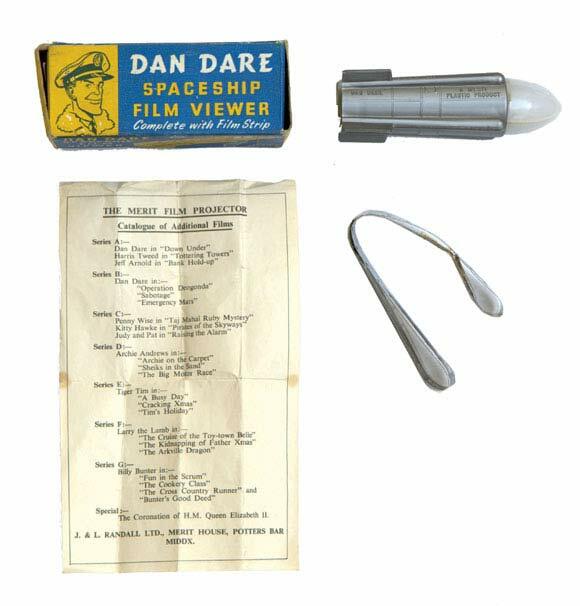 Here was Dan Dare’s Rescue In Space film with the Spaceship Viewer to see it on. 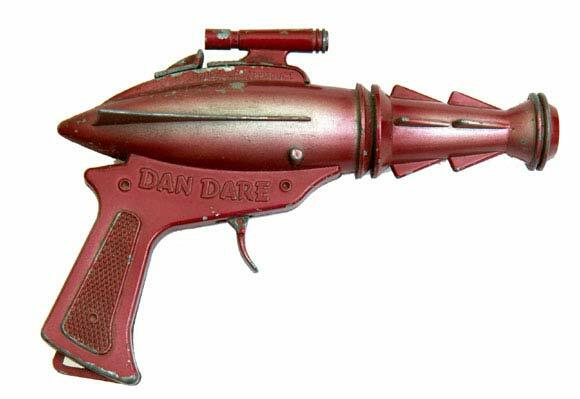 A Space Pistol to mimic the action, and the S.S. Eagle Friction Spaceship for background noise. All senses assaulted for £110, £132 and £110 respectively. 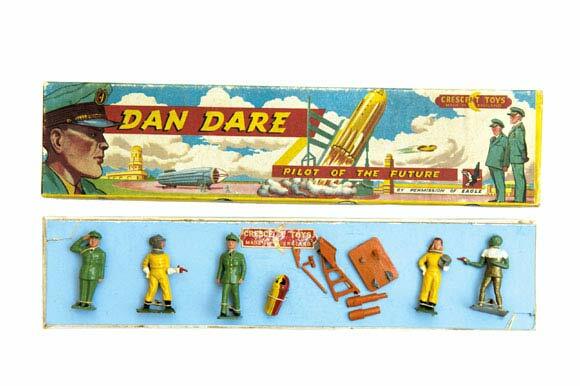 Crescent Toys produced this Dan Dare Figures Set in the early 1950s. The box is impossibly hard to find and the lead figures were often worn. This set had all the figures in fresh condition except for the Rocket Launcher which was in pieces. With a winning bid of £565, the new owner may choose to get out his soldering gun. 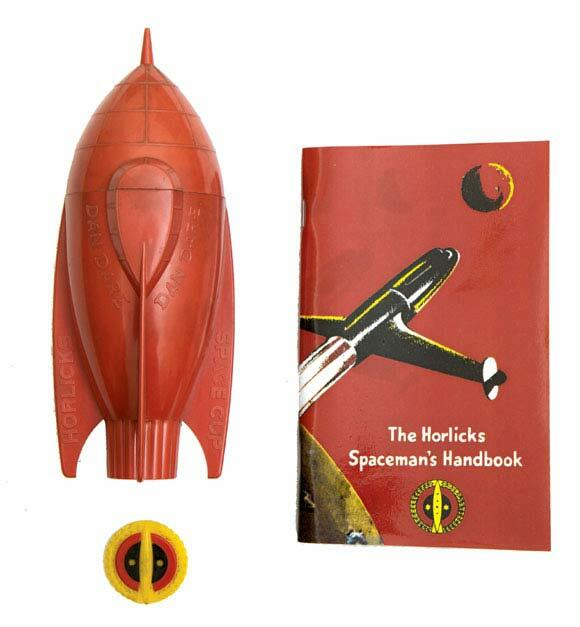 The Spaceship Cup and Cap Badge were originally offered in a promotion where you sent in sixpence or a shilling with a label from your Horlicks jar to get them. £390 was successfully bid - I should cocoa. 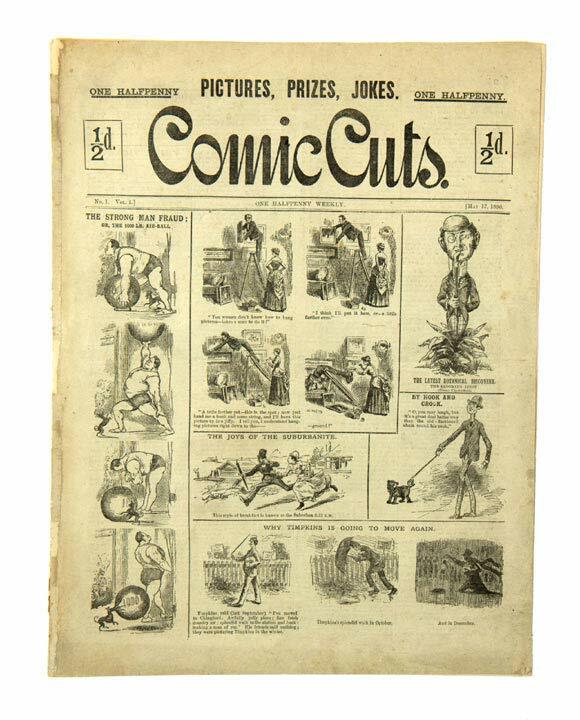 Number 1 of Comic Cuts is rare, there are only eight issues known to exist and this particular copy from 1890 with split spine was in high demand, £550 underlining its historic value. 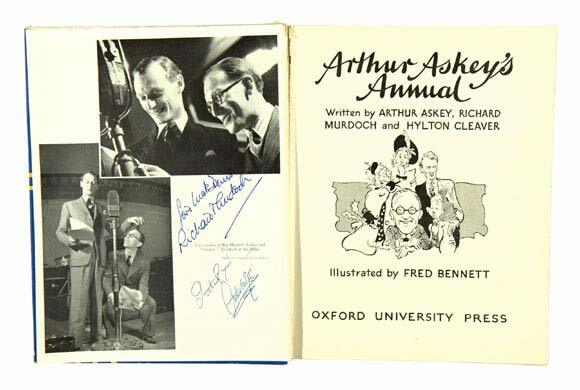 Arthur Askey’s annual of 1939 was a one-off publication dedicated to the wee man. It was signed on the first page by Big-Hearted Arthur and Richard Murdoch and with its provenance of the Denis Gifford archive, it secured £165. Aay thankyou. 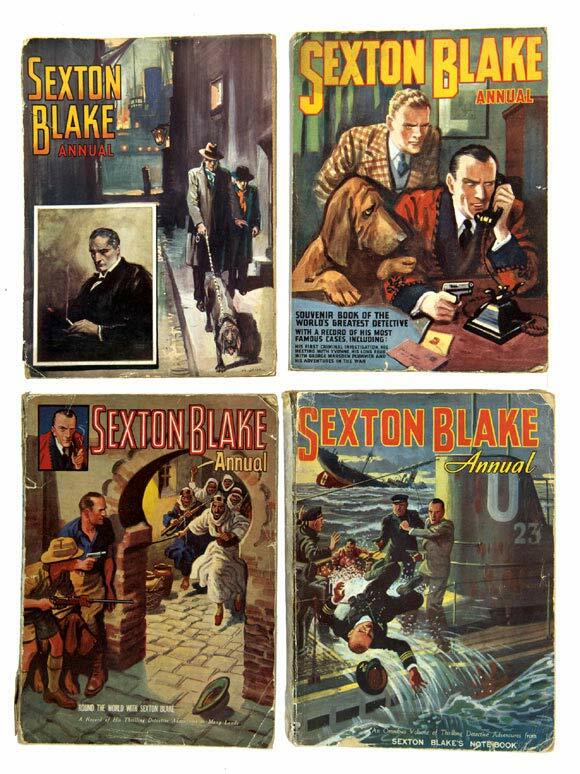 There were only four Sexton Blake annuals published and this was the first time we had ever been able to offer them together. £220 won the day. No Tinkering. 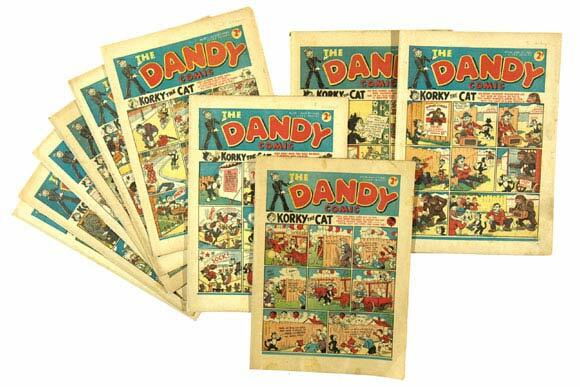 Propaganda war issues of The Dandy are always in demand and with issue 28 featuring a front cover of Nasty Nazis, Addie and Hermy, these 10 copies in average grades made £355. 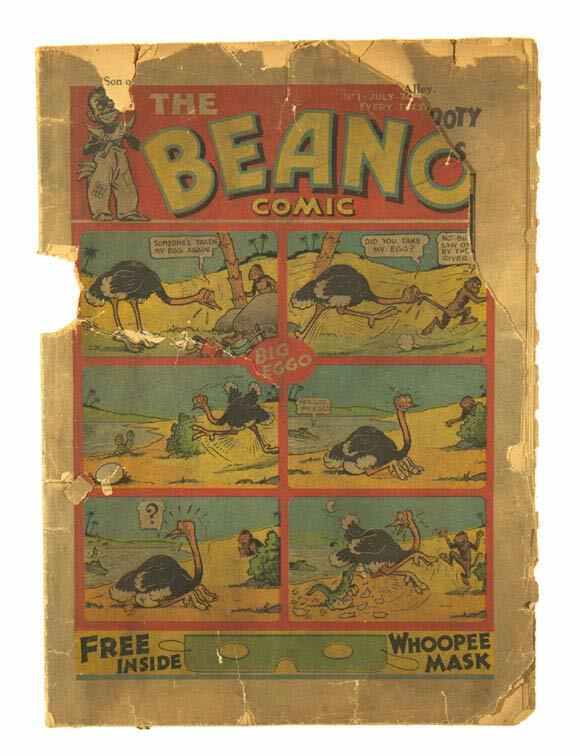 Here was the lowest grade Beano 1 ever offered for sale. The cover was dull and dark, the page quality brittle with chunks missing and we had stated in the catalogue text [poor], the lowest applicable grade. With more than twenty serious bids, £715 finally won the day. 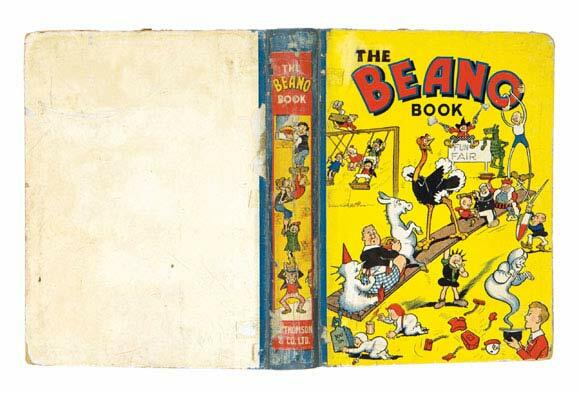 This Beano Book No 1 had some professional restoration with the original spine illustration laid over a new spine. Pansy Potter was still strong enough to hold up the Beano crew on a seesaw and this robust copy claimed an over-estimate £1760. 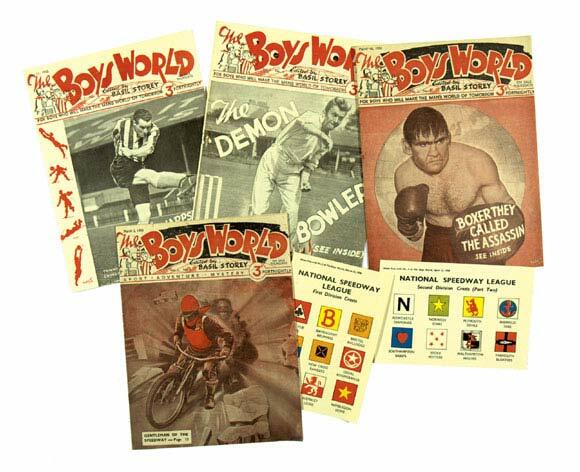 Printed in 1950, Boy’s World comics are generally difficult to find in fresh condition. Comprising No 1, a couple of free gifts and most of the 17 issues on offer, £121 seemed jolly good value. 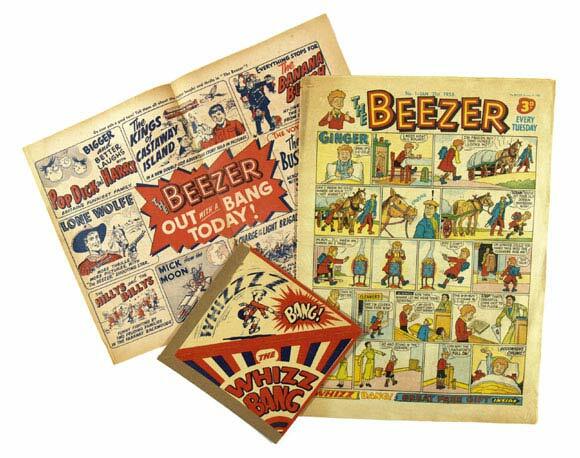 Beezer and Topper were like new bigger versions of Beano and Dandy as DC Thomson attempted to freshen up their stable of titles against the ever present competition from Amalgamated Press. In 1956 Beezer No. 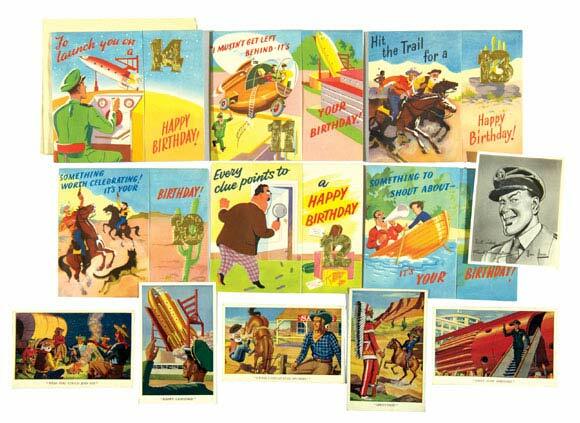 1 heralded the adventures of Ginger by Dudley Watkins and The Banana Bunch by Leo Baxendale with a free gift Whizz Bang to frighten your parents out of their skin. Also included was the original 4 page flyer advertising the first issue and this complete combo fired the imagination and bidding to a stratospheric £477. 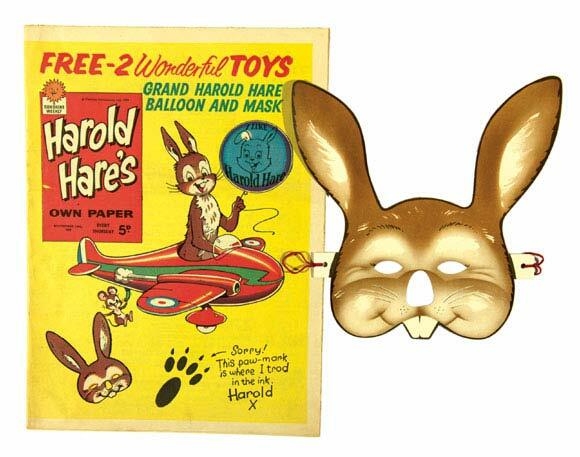 Another rarity from 1959 was the free gift Harold Hare Mask with the eponymous first issue. Featuring Mr Toad from Wind In The Willows, everyone was jumping to the tune of £203. 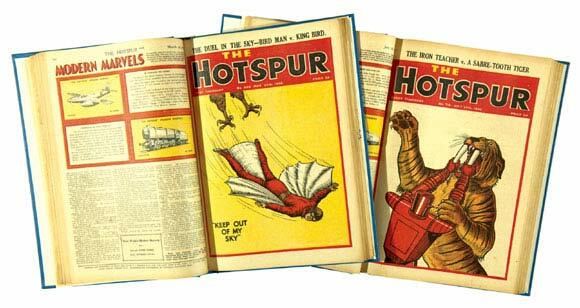 The Hotspur is one of the most enduring and popular story papers to come from publisher DC Thomson and fresh copies in bound volumes always do well. Here was the complete year from 1950 where £203 was given top marks by the Iron Teacher. 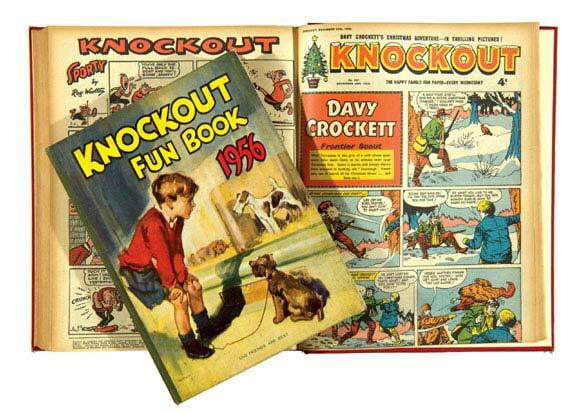 Also complete in a bound volume, the Knockout year of 1956 was accompanied by its 1956 annual. 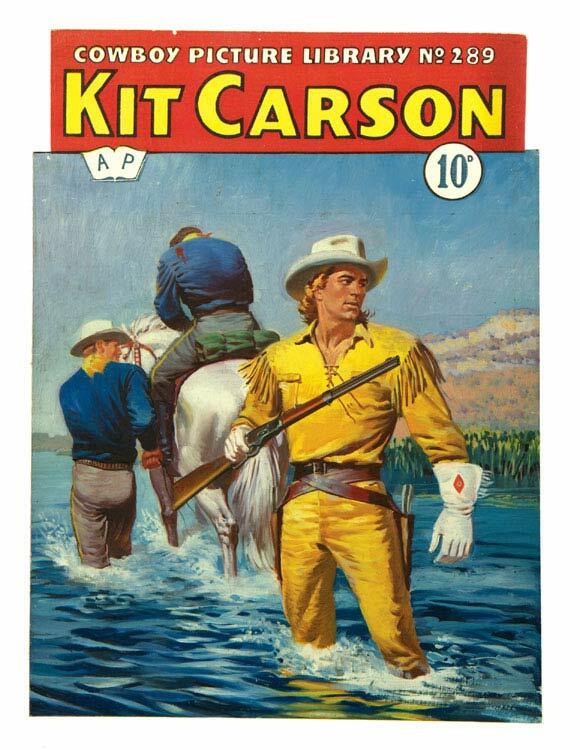 Starring old favourites Davy Crockett, Sexton Blake, Hoppy and Johnny Wingco, £302 was duly tendered. 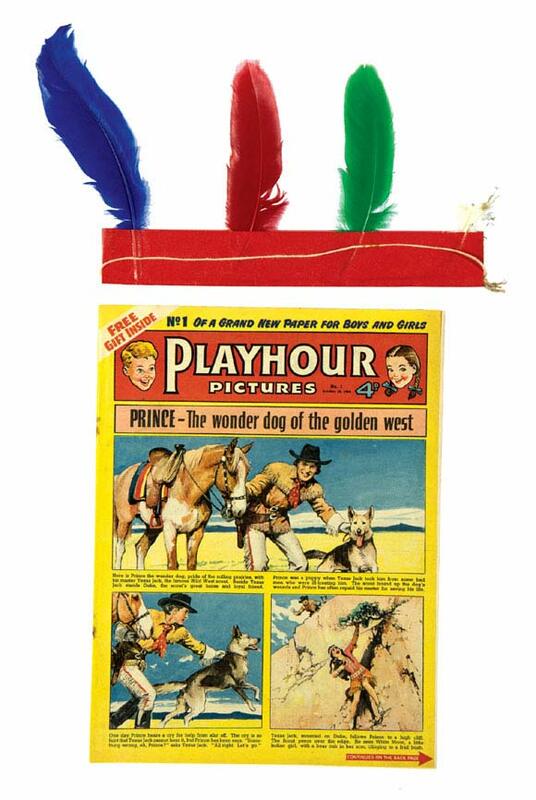 Kiddies comics generally sell less well than their elder cousins but Playhour No1 was crowned with its free gift Indian Head-dress. Even with one feather missing £170 succeeded without reservation. 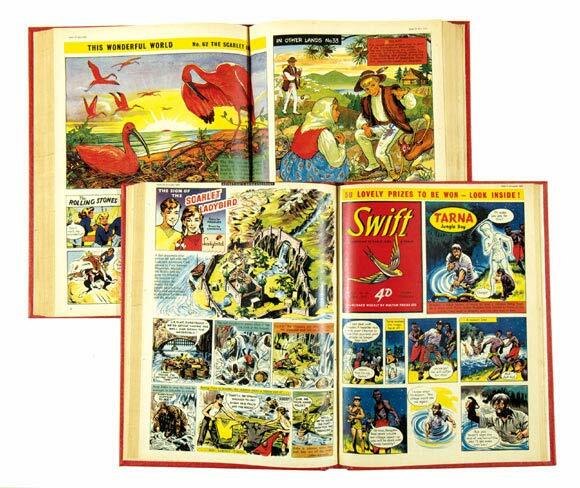 The Eagle’s younger sibling, Swift, was presented here, its first 94 issues bound into 3 volumes. Tarna The Jungle Boy and Michael Bentine’s Bumblies were present but £467 took them away. 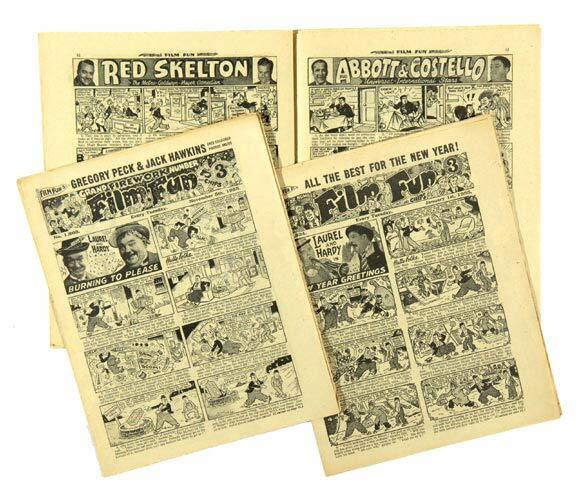 Thriller Comics Library has many fans and twenty-three issues between 7 and 162 from the early Fifties delivered £182 or £8 a pop. 1956 Film Fun starred the other dynamic duo, Laurel & Hardy, who were ably supported by Tommy Cooper and film stars, Gary Cooper and Burt Lancaster. The full year in fresh condition Vera Cruzed to £268. 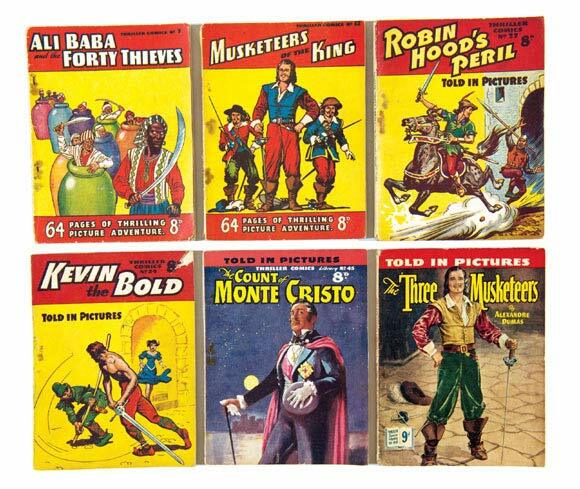 TV Boardman comics highlighted the art of Dennis McLoughlin. 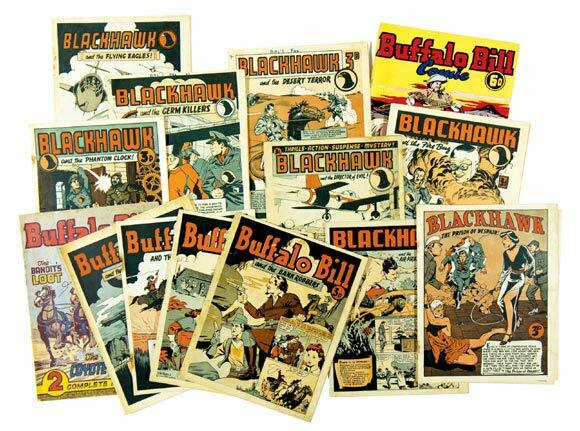 There are many collectors of his wild west and hard-boiled detective stories and sixteen issues of Blackhawk and Buffalo Bill, some with worn, disintegrated staples, garnered a high £193. 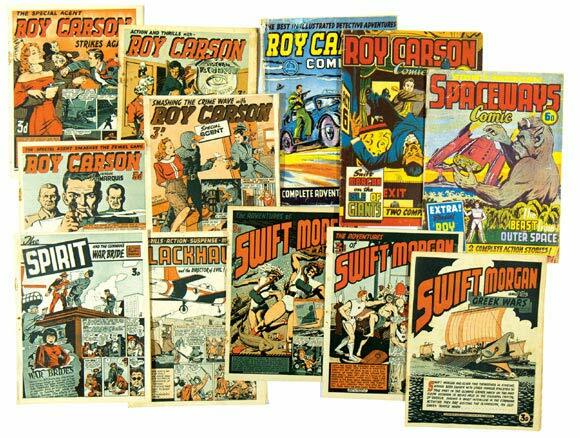 This second lot of 12 TV Boardman titles featured Roy Carson and Swift Morgan and a similar £198 hit the spot. 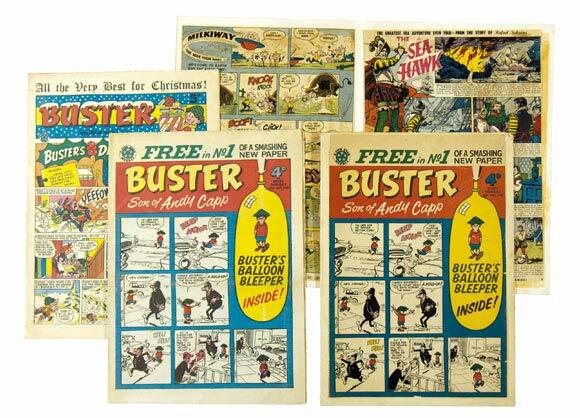 Biffo’s mate Buster got his own comic in 1960 but the unique rarity accompanying this first issue was the original printer’s dummy copy, a mock-up created to check clarity, pagination and colour separation for the editor’s approval prior to the initial print run. £239 price-buster. Oor Wullie has legions of fans and so does his pet moose, Wee Jeemy. In a story that you can read and enjoy above, Dudley Watkins illustrates once more his mastery with the pen. Moose trapped £495. 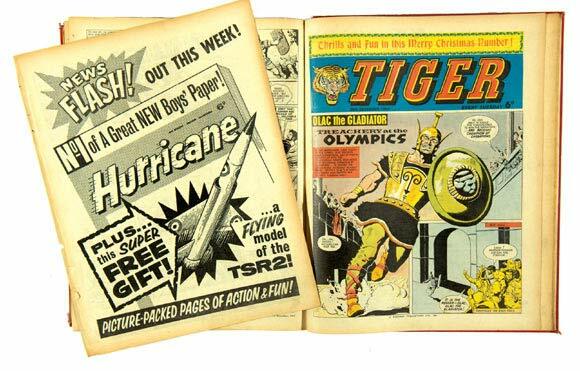 Two publisher’s bound volumes of Tiger for 1964 starred Olac The Gladiator, Jet-Ace Logan and Roy of The Rovers with a flyer for Hurricane No 1. Roars of approval with £412. 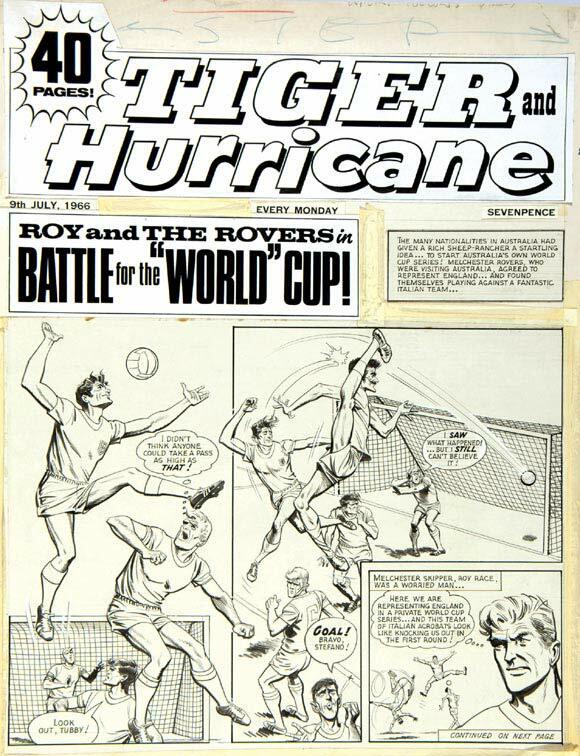 Tiger’s front cover artwork from 1966 starring Roy Of The Rovers by Joe Colquhoun scored at £170. 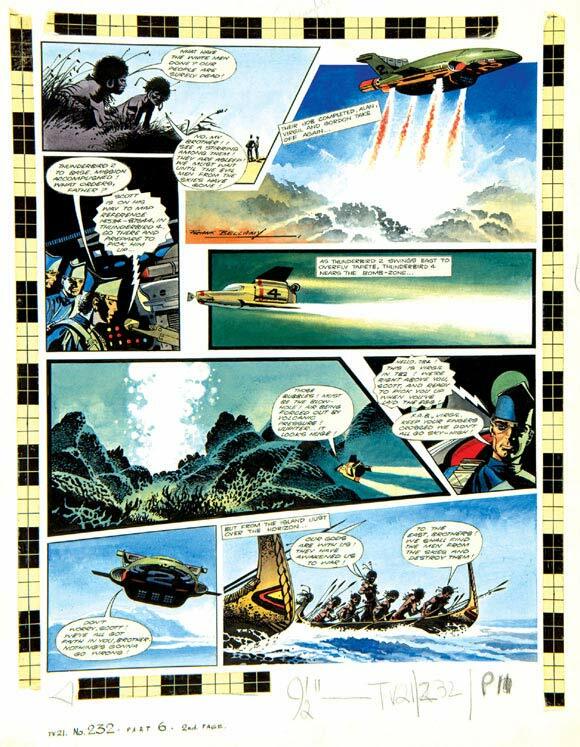 Alan, Virgil and Gordon take off in Thunderbird 2 as Scott nears the volcanic bomb-zone in Thunderbird 4...Frank Bellamy’s suspenseful TV 21 artwork from 1969 with bright Pelikan inks was chased to £1750. Thunderbirds Are Gone. 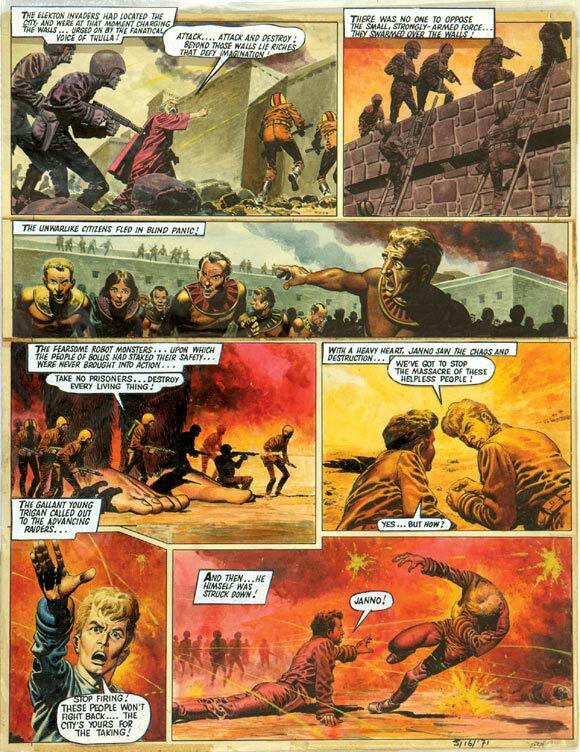 During the ferocious Elekton assault of Bolus City, Janno is cut down by gunfire in this artwork by Don Lawrence from Look And Learn 30, March 1968. £1375 signals the rise of The Trigan Empire. 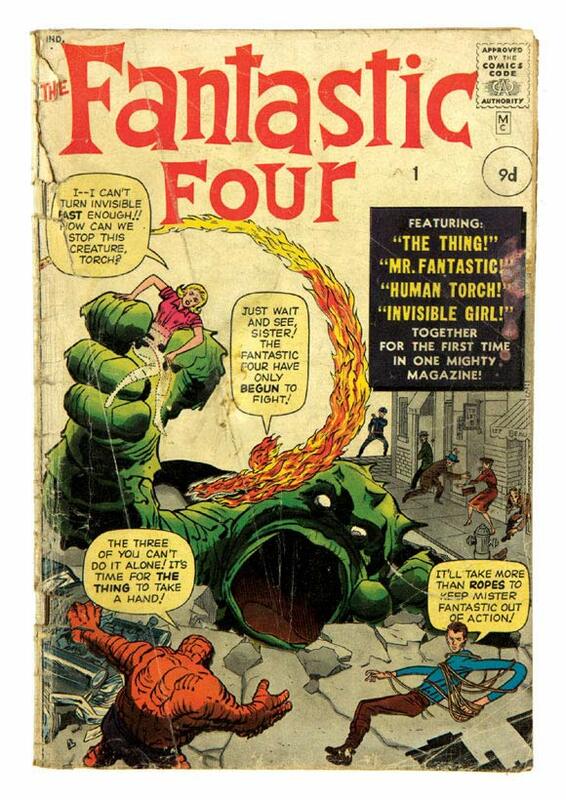 Classics Comics were reprinted profusely in the 1950s and 60s but first editions still attract premium prices. 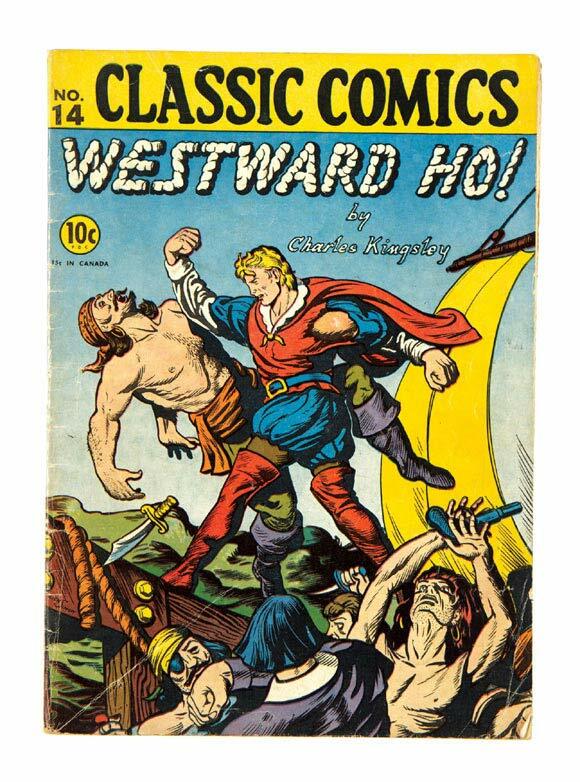 A first from 1941 illustrated Charles Kingsley’s Westward Ho! and with no major defects commandeered £225. A couple of weeks ago I went to the London Super Comic Convention. This took place at The Excel Centre in Docklands and a trip on the tube changing to the DLR (Docklands Light Railway) took an easy 25 minutes from central London in bright Spring sunshine. Seeing the queue to get in stretching for what looked like half-a-mile through the cavernous building before it even snaked in to the exhibition hall itself soon turned the forecast to gloom. It was half past ten in the morning and as we shuffled along at the pace of a stick insect I wondered if I should have brought a packed lunch. At eleven o’clock and having advanced from one end of KFC to the bin bags at the other I noticed that ahead of me loads of people were in superhero fancy dress, Superman with his Supergirl hardly able to leave, let alone leap, tall buildings. As the light bulb appeared above my head I took my notebook from my satchel and with trusty mobile locked on Video began to make my way down the line ‘interviewing’ the DC and Marvel makeweights. In ten minutes I was outside the entrance where I had developed this debilitating limp whilst brandishing my dog-eared business card at a harried assistant in front of me. Luckily I was ushered through into what I can only describe as an aircraft hangar. The front part was packed with stands of comic dealers, a few having travelled especially from the US, and all jammed with comic fans. If this was the oasis then the back was a concrete desert, the hall half full. My hand fumbled for my mobile, now suddenly unable to perform the basic function that had been so well employed outside. But I got off a couple of stills and then he was gone.